particles and granules whereas abrasive forces can cause fines and dust, and this is often an undesired phenomenon. rapidly. Also more and more techniques become available to mimic the behavior in powder processes on a laboratory scale. This course teaches you how to make the connection between powder properties and physical properties (e.g. particle size with powder flow and compaction) on the one hand and the modeled background of these properties on the other. 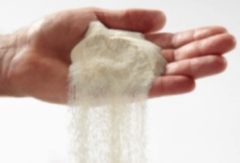 You will learn how powder flow can be determined and how to change powder properties, so that the performance can be adjusted in applications. You are a process engineer, mechanical engineer, food technologist or chemist with a bachelor or academic background and you are working in an industry where solids are processed or manufactured (powders, granules, etc.). Also as operator, analyst, or otherwise interested in these topics, one can greatly benefit from this course. Solids transport and the strength of particles, also in relation to attrition, formation of dust, etc. The course will be given on the location of Delft Solids Solutions in Wateringen (near Delft), where a well-equipped laboratory is available. Among various readings there are short demonstrations. Many of the experimental methodologies and techniques discussed can be seen in operation. After the course you understand the basic concepts of processes and techniques in which powders and granules play a role. You will be able to design or modify a process in such a way that it is optimally adapted to produce products with the desired properties. On the basis of the many examples, you develop a comprehensive understanding of how powder and granulate properties can be decisive for the final application and how to adapt these. The next course will be held on Wednesday 15 and Thursday 16 November 2017. The investment in this 2-day course amounts to € 1.475,- ex. VAT.